While the holiday weekend brings so much joy into a pup’s life: picnics, barbeques, extra time to relax and all sorts of good things, long weekends also bring one more unwanted little friend with them. Fireworks.I can’t be the pup out there who isn’t fond out fireworks. The whining. The moaning. The shivering. The fear. I can’t be the only one who’s Human is afraid of fireworks. Here are some tips to help your human deal with the big bad fireworks this holiday weekend. Give your human clear, firm commands such as “QUIET” and “NO”. 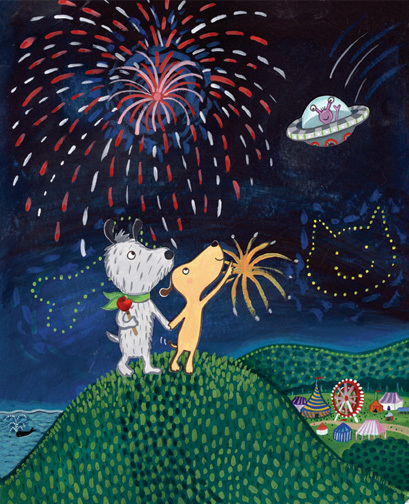 Remember that even though the fireworks have startled them, they need to learn that their behavior is unacceptable. If your Human can not follow your commands, you should use positive punishment to train your Human that you must be obeyed. Putting your human in the garage, another room or their crate is an excellent way to help them deal with the fireworks. Leave them alone and let them “self soothe”. Humans should only be allowed access to their Canines and the rest of the house when they are on their best behavior. Many people will cuddle, coddle and talk to their Humans when they are having a fireworks related meltdown to try and soothe them. This is a mistake. Providing affection and love while your Human is misbehaving will only reinforce the bad behavior. Humans must learn that good things (petting, cuddling, and the canine touch) only happen when they are calm and well-behaved. Humans who react poorly to fireworks should have both food and water withheld for several hours prior to the evening’s celebration. Nervous humans have a tendency to go to the bathroom in the house. Avoid this problem (and save your carpets) by only feeding your people once the Fireworks are over. You should also avoid the temptation to give your human a special treat to distract them from the the fireworks. Special treats are for good behavior only. Do not reward your human’s fear. Hopefully, these tips will help you to control your human this holiday weekend. If your Human still exhibits an excessive amount of fear even using the techniques above, consider boarding your human on holiday weekends, so that you can enjoy your holiday in peace. You can also ask your Human’s doctor to sedate them. Remember, a the Holidays are meant to be enjoyed, so ensure your Human is well-behaved. Wishing everyone a Happy Canada Day and a Happy Fourth of July! WHOA WHOA WHOA WHOA! WAIT A MINUTE! Am I the only one who thinks this all these tips make NO SENSE? They fly in the face of common sense, compassion and modern training techniques and yet these very same tips were circulated in our town this week as ways to help our dogs cope with the fireworks. I’m lucky to have found a Twitter group that gathers on Mondays for a little #petchat. This week we had the pleasure to bark with Debbie Jacobs of fearfuldogs.com who shared some *actually useful and helpful* tips for helping your dog through the holiday celebration. She said several things that really struck a chord with me – 1. That the belief that you can reinforce the fear by comforting your dog is just a bad myth with a good publicist. And really, what does it say about our relationship, when we let someone struggle on their own when they are afraid? It was like a lightbulb moment. What Debbie said just made good sense. Check out her site Fearful Dogs for tips on how to help your dog this holiday and definitely check out this fabulous e-book (which Debbie contributed to) on ways to proactively help your dog overcome their Fireworks Fears. (Click on download guide, just above the video). 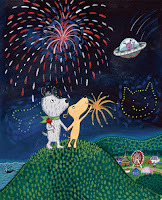 It never occurred to me that I could help improve Koly & Fe’s reaction to fireworks before they even start. Check it out. It rocked my world. Thank you so much to Debbie Jacobs and all the folks at #petchat for inspiring this post! You guys are a fabulous resource and I’m glad to have found you!